Studying any material related to autism should be mandatory for all teachers. Apart from the actual teaching of a specific subject, we must support our students, we must care for them and their problems and do everything within our means to help them. We didn’t choose this profession to kill time, we chose to be teachers out of love for children and the need to offer. At least that would happen in an ideal world. Unfortunately, there’s always a significant number of teachers who consider teaching a chore that they must carry out and be done with it. Psychology and research mean very little to them. So, this is not reading material for these ‘’teachers’’. However, it is of special importance to the rest of us. Dr. Sarah Bagiela has developed a concise booklet on the ways autism can be diagnosed and its influence on various aspects of daily life. ”Camouflage”. An excellent choice for the title of the booklet, in my opinion. Dr. Bagiela stresses the differences between women diagnosed with autism and men who face the same situation and presents a number of extremely interesting conclusions. Women hide, camouflage autism by resorting to social mimicry skills. In my opinion, this is one more indicator of the subconscious, powerful influence of social norms on the sexes. Developed around three interviews of women diagnosed with autism, we are introduced to the notions of restricted interests, repetitive behaviours, and sensitivities. The difficulty of social interactions and the importance of interests in the life of these women. And what about men, you may ask. This is not a book on men with autism but on the secrecy and complexity of the world of autistic women. It has nothing to do with equality or inequality as a review mentioned and it’s time to stop seeing monsters where there are none. It’s getting tiresome. Researchers deal with specific fields. This is exactly a specific field, whether some like it or not (or choose to let their prejudices blind them…) And it is an excellent read. 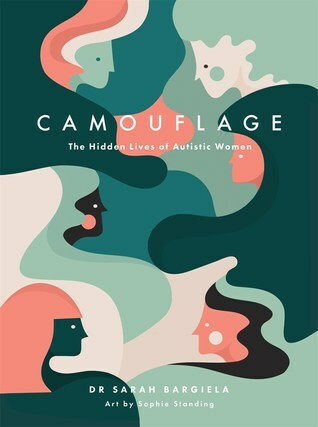 Enriched with beautiful illustrations by Sophie Standing in green, orange and white and with a very interesting bibliography, Camouflage will interest those who seek to start reading on autism and the ones who have extensive knowledge on the subject. It is moving, powerful and very, very real. Many thanks to Jessica Kingsley Publishers and NetGalley for the ARC in exchange for an honest review. This sounds like a fascinating read, and that cover design is so clever! That’s a great opening paragraph! Autism is plaguing our children more and more. I have to wonder why? There has to be a reason. I am glad this book looked into the issue with adult autism. It sounds fascinating. Autism is not a disease, nor a health issue. It is a disorder whose cause is yet to be discovered beyond all doubt. Genetics and environmental factors are believed to be the main causes of autism. As long as there are ”leaders” who refuse to acknowledge the climatic change and people who believe that parenting is an obligation, it falls to teachers to support their students.